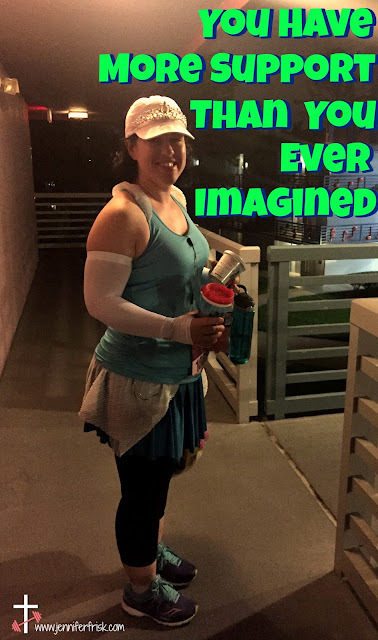 Today is the 6th and final lesson I'm going to share from the 2017 Disney Princess Half Marathon. I have to admit: I have been looking forward to writing this one from the very beginning because it is my favorite. In my opinion, it's also the most important! Before we get to that, though; as a recap, you can find lessons 1-5 here, here, here, here, and here. As I originally said in lesson 1, I was supposed to run this race with one of my dearest friends; but when she suffered injury, I felt like I was on my own. I trained on my own; I struggled on my own; I battled doubts on my own; I felt completely alone. Don't get me wrong; it wasn't that other people didn't care. They just weren't involved. In a lot of ways, that's just how it had to be. But then something happened in those last few weeks leading up to the race. That friend - the one who was injured? She graciously offered to help me make my costume. Can I be frank? This talented lady MADE my costume! I'm pretty sure I was just there for comic relief. I mean, she shopped with me for fabric. She helped me realize my vision for what I wanted in the flesh. (And I tend to get a little abstract when I think of things.) I don't tend to like things just off the shelf. Yet she worked with me to make my ideas reality. Along the way had some pretty silly moments with glitter and fabric, as well. Of course, those are the best kinds, right?? And our final seamstress evening? Our menfolk even joined in the silliness (to a small extent...haha). The whole thing was a pretty special lesson in support. The costume went a long way towards making me feel like I had a friend out there on the course. That was the first instance where I felt like there was more support for me than I ever thought! The day of the race, though, my socks were thoroughly knocked off. Let's set the stage, shall we? I had to be ON a bus before 4AM. Which means I had to be eating breakfast at least by 3:30 AM. Which means....I set my alarm for 2:30 just to be safe. I set up my costume and everything I would need in the morning in the bathroom area of our hotel room so as not to wake my husband and had my phone right next to my ear so that I could catch my alarm ASAP. The alarm went off; I scurried to the bathroom to get ready. And then the BEST thing EVER happened. I opened the curtain to find the mister putting on his shoes!! Guys, this is BIG! Monumental, even! In the roughly 10 years that I've been running, the mister had been to exactly *one* race. I never dreamed he'd get up with me! But get up with me, he did. And he accompanied me to breakfast. Again, guys, I was FLOORED. And my heart was just a little more buoyant than normal. Guys, listen. Seriously, just listen. If you feel alone, lonely, alienated, or just outside of any conceivable "tribe," I promise - I PROMISE - there is support out there! You may not see it; you may not feel like you have found your tribe. But they are out there! They may be silent, but their cheers are there! Just like the cheers of my travel companions as they watched me cross the finish line. You may never know who is rooting for you or who is pulling for your success. But I promise you, they are out there. And one of those "they's"? She right here writing to you.